For those not native to France, navigating social etiquette can be considered a minefield of bad manners. Is it one kiss, two, or even three – or perhaps none at all?! Any Francophile will tell you that the number of kisses varies from region to region in France, and also depends on the group dynamic – you wouldn’t greet a friend in the same way you’d greet your boss, for example. Nor your mother-in-law compared with your little brother. Similarly, men generally shake hands with men, while women tend to exchange la bise with all genders. No wonder French formalities leave guests bewildered! 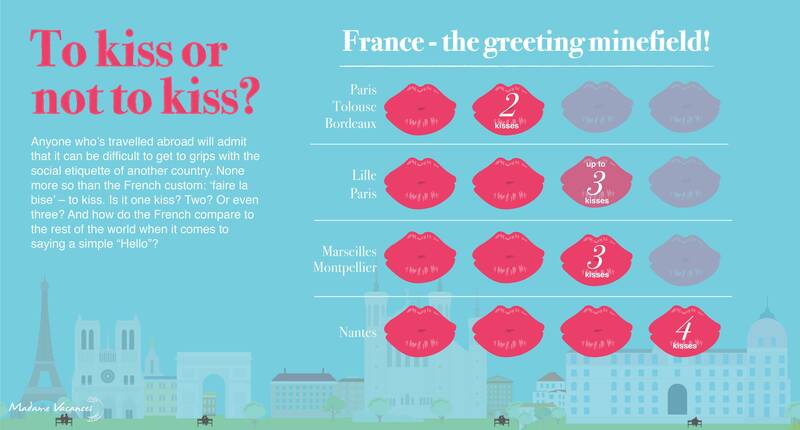 Today is International Kissing Day, and to celebrate the love, Madame Vacances has investigated common national niceties from France, greetings around the world, and a few international no-no’s to avoid! Whilst Paris, Toulouse and Bordeaux share a modest two kisses, Nantes natives spread the love with a flurry of four. In Lille, up to three pecks is acceptable, whilst Marseilles and Montpellier keep to the rule of three. It’s not just the French who kiss hello; Italians say “ciao” with two, and Spaniards are generous with three. In Russia, a kiss on the hand for a female is customary, whilst in Saudi Arabia males offer one another a kiss on the cheek – but never to a woman. 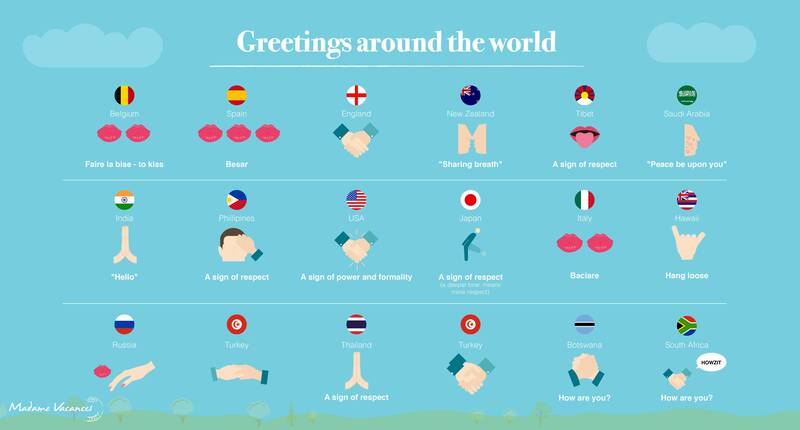 It’s no surprise that the UK and USA are fans of the handshake, or a shy peck on one cheek, while more unusual, but still polite greetings are found elsewhere – from poking out one’s tongue in Tibet to pressing noses in New Zealand. 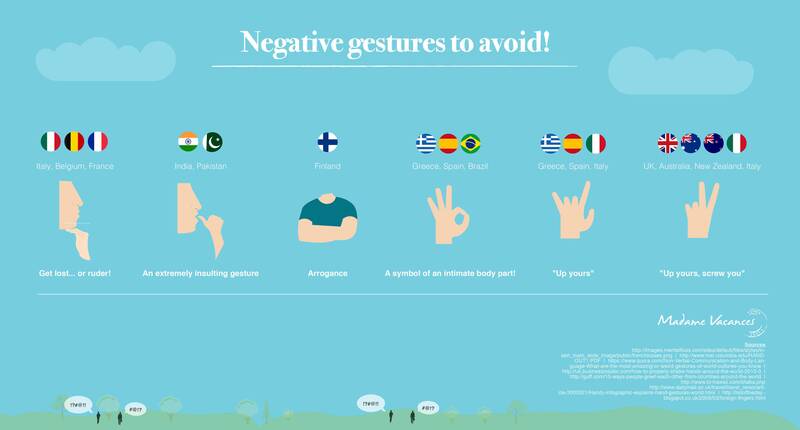 However, travellers should proceed with caution as some gestures which are well-known and loved in one region are considered highly inappropriate or even offensive in others. The reversed “Victory” hand gesture means peace in the United States, but something very different in the UK and Australia. A reversed “rock on” has rather a rude meaning in Spain, so watch out metal heads! Perhaps the most bizarre of all, the supposedly universal sign for “OK” has a rather obscene meaning in Greece, Spain and Brazil. We hope our To Kiss or not to Kiss infographic can help you through the potentially problematic art of puckering up! Now, has anyone seen the lip balm?